Last night, while I was on phone with Mogit, I felt the building shake. I thought it might have been some heavy vehicle passing in front of the hotel. I found no traces of any vehicle in the darkness outside my room’s balcony. It wasn’t until today morning that I got to know that an earthquake of magnitude 5.1 had shaken Uttarakhand with its epicentre about forty kilometres west-northwest of Joshimath. I was informed that the Joshimath-Auli ropeway operated between 9:00 AM and 4:00 PM during the winters. For just seven hundred and fifty rupees, one could easily obtain a return ticket for Auli, one of the premiere skiing tracks in the country. Once I was at the boarding point (roughly at 9:30 AM), I got to know that the ropeway only operated once they had at least six passengers. I was the only one there. To my bad luck, the ropeway was supposed to undergo a scheduled maintenance from 10:30 AM. It was impossible for me to gather five more people. 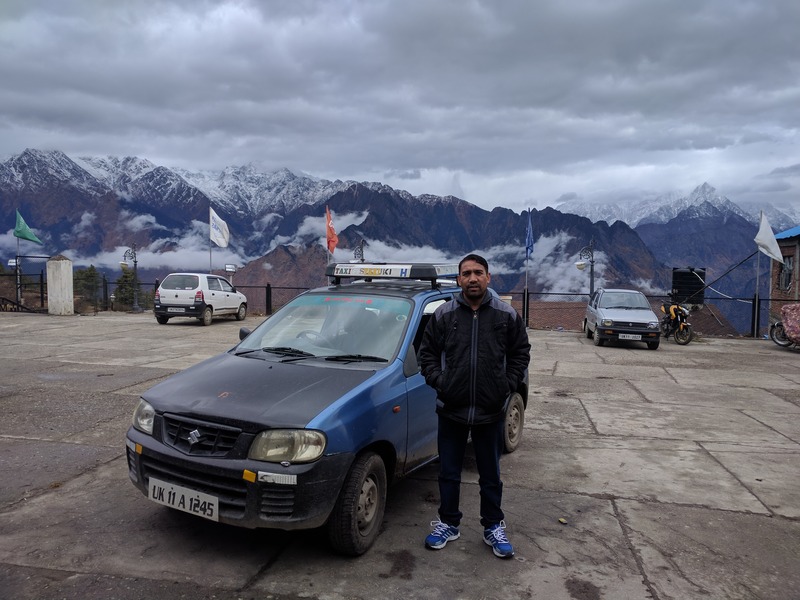 Mr. Dinesh, a ropeway technician employed by GMVN, helped me get in touch with a cab who agreed to take me to Auli, wait there and get back in the evening for twelve hundred rupees. It wasn’t a bad deal. Harish, my taxi driver, also told me of places around Joshimath that I could venture to but most of it was inaccessible during the winters. Although the hiking distance from Joshimath to Auli wouldn’t have been that much, it might not have been possible because a large chunk of the area was under the control of Indo-Tibetan Border Police (ITBP). The motorable road passed through their checkpoints and their training terrains but they don’t bother the tourists. Right beside Auli’s GMVN bungalow, the last motorable point, was Skiing and Mountaineering Institute run by ITBP. Sandwiched between these two areas was a lonely Hanuman mandir that faced the majestic mountain ranges of the north. 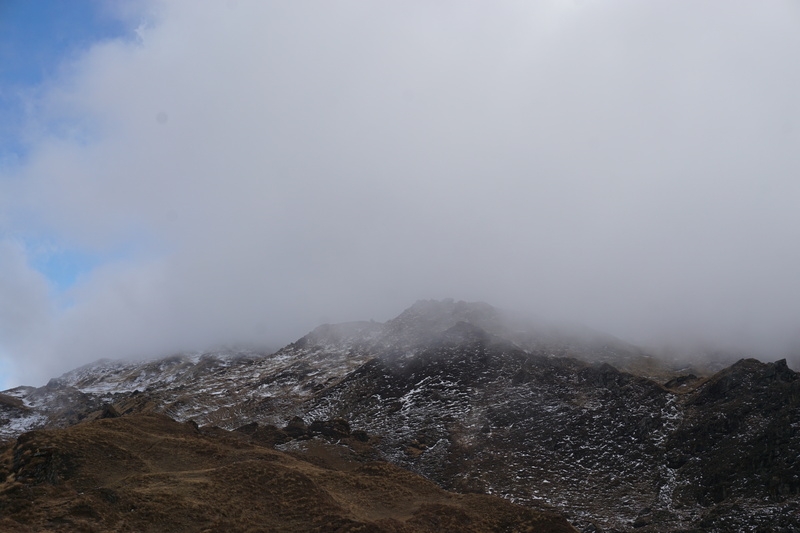 The murky and overcast sky did not allow for a clearer view of the mountain ranges. 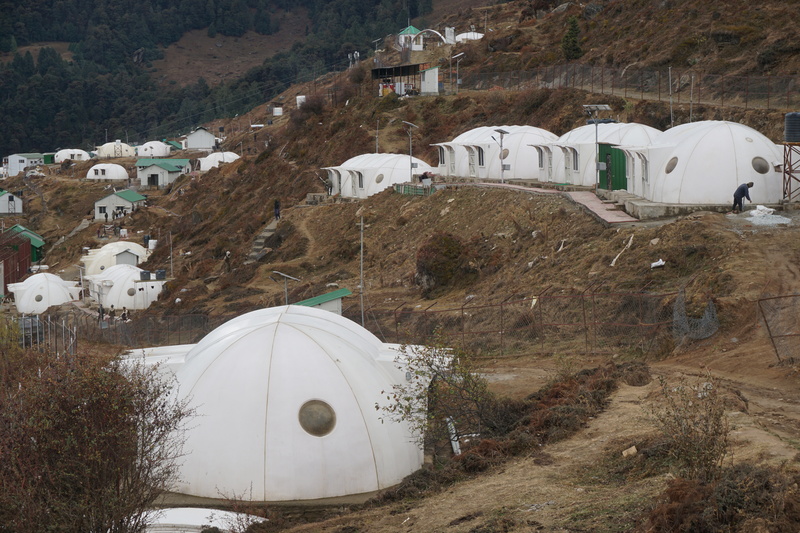 These igloo-inspired shelters inside ITBP area looked like a series of UFOs. There was a chair-car that transported passengers from Auli’s GMVN bungalow to the top of the ski-slope. 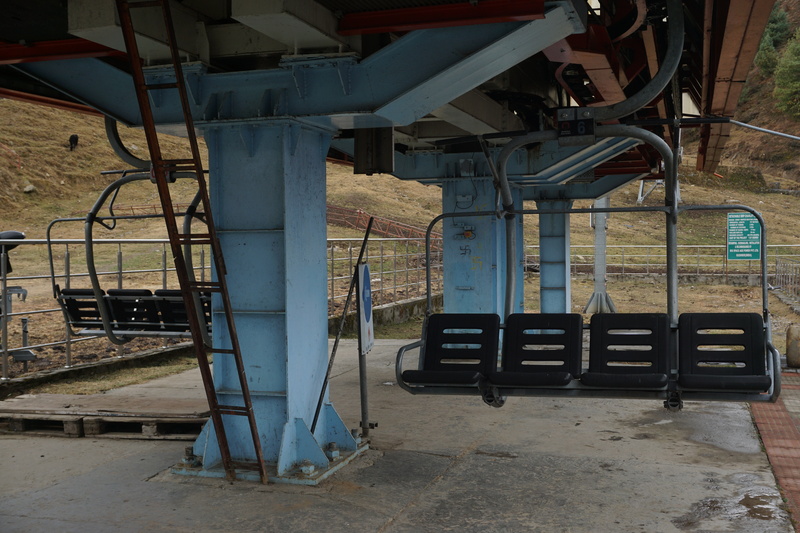 Unlike the ropeway, this did not require a minimum number of people to operate. Instead of taking the chair-car, I walked all the way to the top. The ski slope had no snow and was being prepared for the upcoming season. They had snow machines to take care of the arena in case nature wasn’t kind enough with adequate amount of snow. A GMVN employee even told me that the season would open on December 25th and bookings had already started. Chair-car station at the top of Auli. 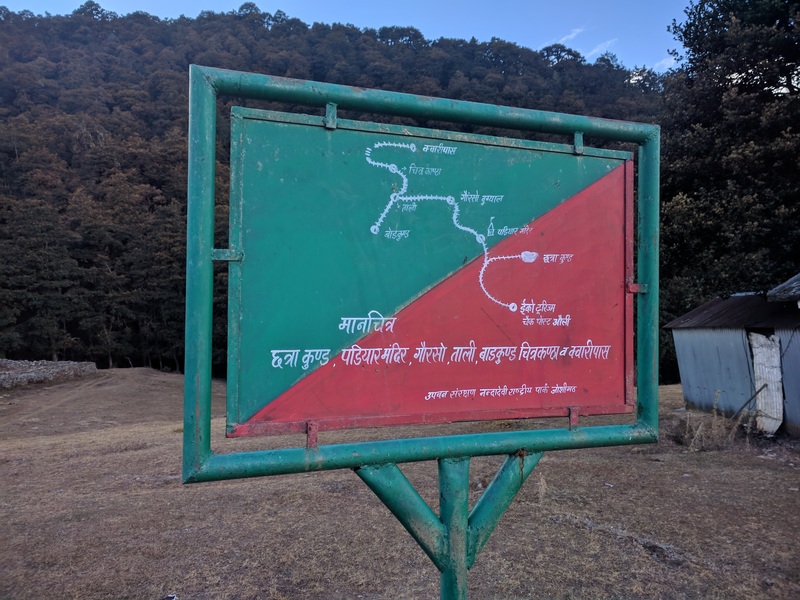 The end point of the ropeway—also known as ‘station 10’—was the starting point of Kuari Pass trek. Going there required preparation for overnight camping and extra rations to not only survive during the trek but also some surplus in case there was a snow storm that could delay the return. 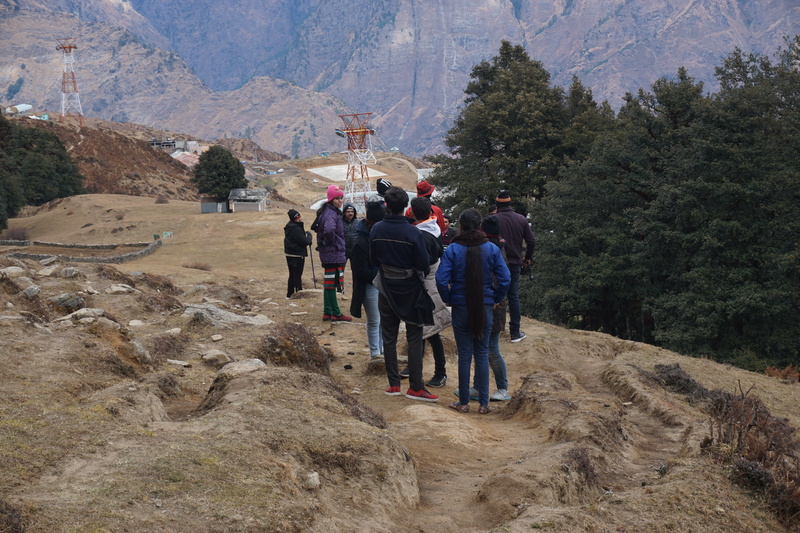 About three groups had hired guides to go to a view point known as Gorson Bugyal. (Bugyal in Garhwali means meadows.) I was asked by the officer to follow one of them. He charged me an entry fee of twenty rupees. A not-to-scale map of the Kuari Pass trek. The trekking group that I was asked to follow. I went past them on my own in no time. One of them nearly threatened the guide if he was unable to take them to snow point. With their fitness, they wouldn’t have been able to make it to there before sunset. I gave myself a hard time-limit of 2:30 PM. I would ascent as high as possible and then get down. 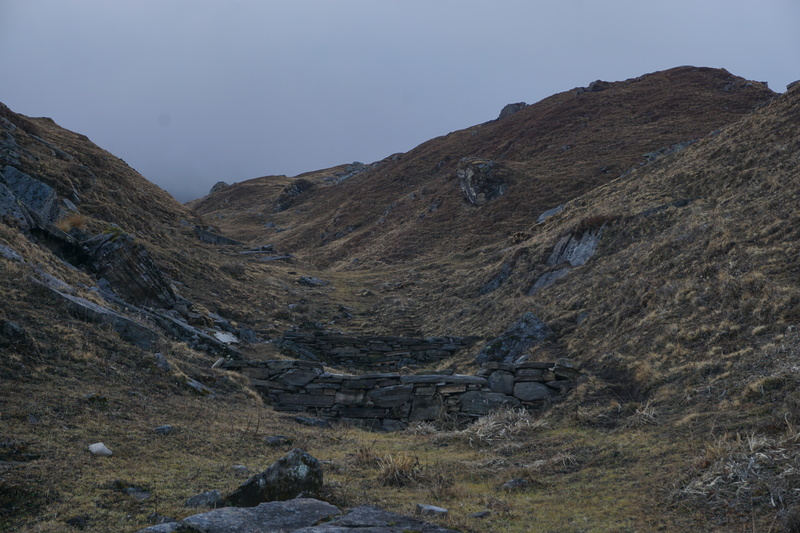 I met at least three Bengali groups—one of them were returning from Kuari Pass. They were fortunate. During this time of the year, some attempts at reaching Kuari Pass are unsuccessful owing to heavy snowfall. 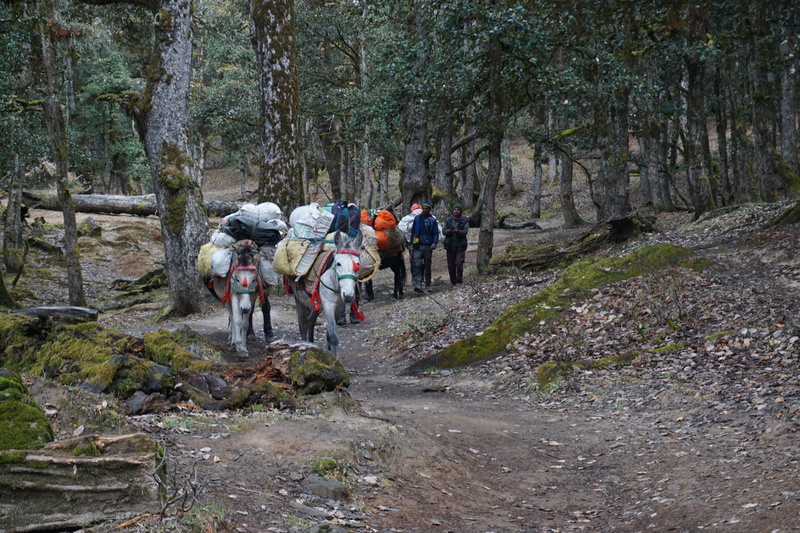 Mules carried back gear and ration of the group that had successfully completed the Kuari Pass trek. The trail started off steep and passed through a forest. 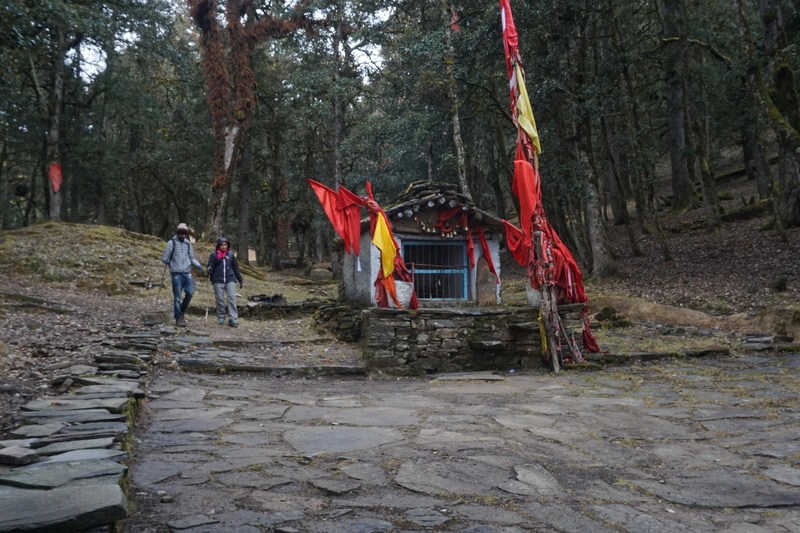 The end point of the forest was marked by a solitary temple devoted to one padiyar devata—a local nature god. This was where I crossed the groups that had started before me. Lone padiyar devata temple. It is more of a resting point for the trekkers than a place of worship. A different Bengali group, comprised of two gentlemen and a lady in their late forties, was headed back from Gorson Bugyal view point. The lady had lost her phone and was lamenting her loss while sitting on a rock in the meadows. Luckily, a few minutes earlier inside the forest, I had met the person who had found the phone. I informed them that they would get back the phone at the GMVN guest house. ITBP had set a flag near the snow point. It was some sort of a training marker for the cadets. A big stretch of the meadows stood before me, between Gorson Bugyal view point and the flag. From afar, I thought it was some kind of a temple. 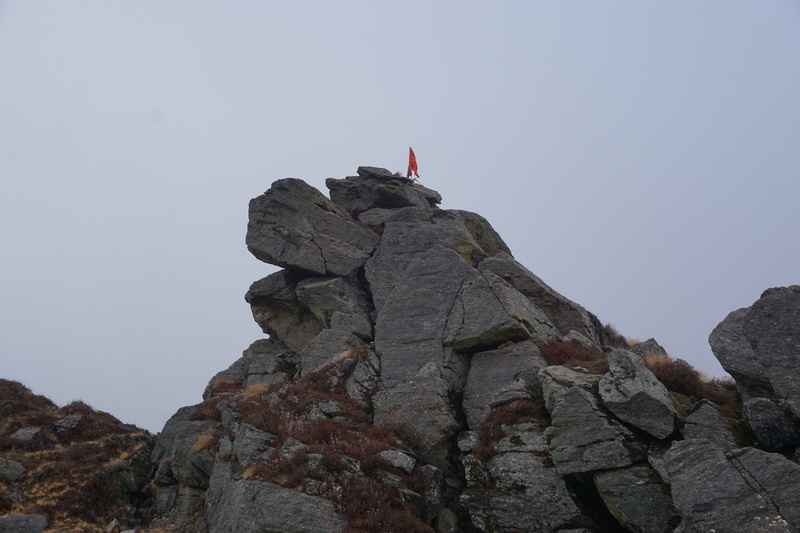 I trekked till the snow point, climbed the small hill and tried hard to locate the entrance of the temple. Only later when I showed it to the locals that I was told of the real intention behind the solitary flag. Monotonous and beautiful meadows of Gorson Bugyal. The start of snow line. 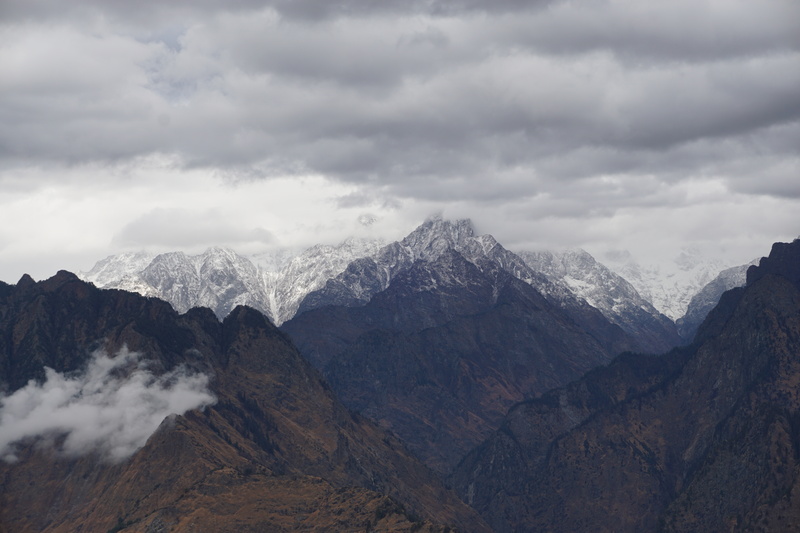 Eventually, as winter progresses, Auli would be covered with snow. The hill with ITBP marker flag for their training. 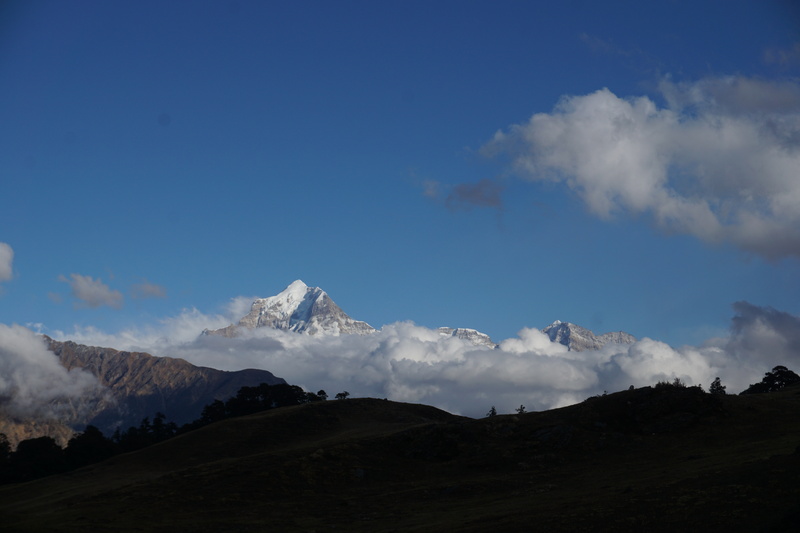 Dronagiri (l) and Nanda Devi (r). In spite of the overcast, I was able to get a clear view of the peaks for about half a minute before the clouds obscured the view again. On my way back, I stopped a a small shack near the end point of the cable-car. I had a plate of Maggi—a food that I try to actively avoid. There weren’t that many choices and barring a guava that I had munched while hiking through the meadows, I hadn’t had anything for lunch. Harish was waiting for me near the GMVN guest house. He dropped me off at Upper Market road at 5:30 PM. Before getting back to the hotel, I paid a visit to the Shakaracharya ashram and an ancient tree adjacent to it. Shankaracharya’s ashram. This place is known as Jyotirmath. 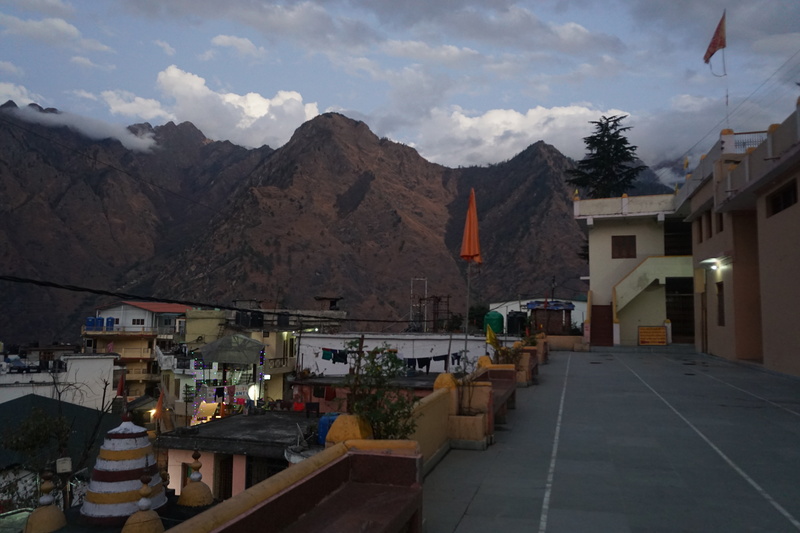 Joshimath is a corrupted form of the word Jyotirmath. The mutton momos in front of Joshimath Gurudwara were so good that I revisited the place for dinner. I even had an extra serving of their chicken soup. It went down pretty well in the cold weather.